A following text is a description of the essentials for our rental car. Please read carefully before reservations. When you hold reservations, please use the website. You can not be booked by phone. If you are travelers, please ask the travel agent or your friends in Japan. Our office is located in Tokyo (Nihonbashi) . For legal regulations, we can not arrange a rental car drivers. Your reservation can be accepted until 14 days before your departure. Please pay the charge by your credit card. At the time of rental reservation is confirmed, you may request a deposit. If you cancel after 21 days of your departure, the prescribed reservation cancellation fee will occur. There is no contact for over 1 hour of your reservation time, your reservation might be canceled. If you receive a ticket for illegal parking from the police, you have to pay the fine immediately. You can not change the lease period after your departure.. 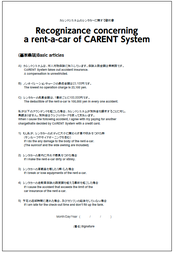 When we loan a car, you have to sign the document "Recognizance concerning a rent-a-car". If you have any questions, please send an e-mail using [Contact form]. After your reservation is confirmed“reservation confirmed mail” wrote the time, charge and location of lending will be sent from us. Finally you check the content of “reservation confirmed mail” and reply to us by e-mail, your reservation is accepted. We will check your credit card valid or not about 1 week before your departure. Seating capacity is 5 people. Pets can not ride. There are a double bed (for 2 adults) with extra bed. 3 adults and a child can sleep. Please refer to the photograph. Two bedding and outdoor goods are equipped in a car for free. The navigation system with ETC・CD player is the Japanese version. We put on a studless tire from November to March. If a child under 6 years old sit on the seat next to the driver, you have to set a child seat. ※We do not have a child seat. There are neither a rest room nor a bathroom. This car can move 6〜8km per liter. In the car, there is a security device made by SECOM. At your convenience, even if you return the car in a shorter lease period, there is no early withdrawal refund. Please return in the fuel tank full. If you do not fill up, the additional charge will be requested on our discretion. When the return, our staff will check the interior and exterior of the car. In cases stench or pollution damage, the additional charge will occur. We can receive some compensation for any accident within the limits on the following. However, damages in excess of the limit of insurance (including car insurance), and accident insurance policy relevant to the disclaimer following the case of an accident caused by the act violated the agreement and the lease, the total amount paid by the customer. Please note that will be. You can receive the road service (ex. battery trouble) for free. Non-operating charge (compensation charge for business) will occur. If you can return to the planned place or our office by a car own self :￥23,100×[repair days] …a maximum of￥231,000. If you can not return to the planned place or our office by a car own selff :￥57,750+ ￥23,100×[repair days] …a maximum of￥288,500. If you have some questions, please ask us by [Contact form].